Liam Trotter's debut goal in the fifth minute of stoppage time earned Nottingham Forest a hard-fought draw against Ipswich at the City Ground. The midfielder, who signed on loan on Saturday morning from Bolton, was on hand to tap the ball into the net after Jorge Grant's shot was blocked. Jonathan Parr's half-volley had given Ipswich the lead in the second half. A first-half substitute, Parr found the top right-hand corner after collecting Eric Lichaj's attempted clearance. In a dominant first-half display the hosts were guilty of missing a number of golden opportunities, as Ryan Mendes failed to find the target more than once. Just before half-time Ipswich goalkeeper Dean Gerken made a brilliant double save, first palming away a drive from Trotter that looked destined for the far corner before jumping up to deny Jamie Ward. Although the visitors found themselves under constant pressure from Forest in the second half, they opened the scoring when defender Parr netted for just the third time in his Ipswich career. With the Tractor Boys heading for their first victory in six league matches, Trotter pounced after Piotr Malarczyk had cleared the ball off the line. The result leaves Forest without a victory in six league games. "It was a performance of a very, very high standard. We should have been 3-0 up at least by half-time. It was a good performance, which did not get us the right result - which is a common theme at the minute. "In the last 10 or 15 minutes the spirit was there for us still and we at least got a point out of it. We kept on going and I was happy with the spirit, happy with the performance and, from that, I believe the results will come. "It is not relief. I am pleased with the way we passed the ball, with the way we controlled the game and created four or five very good opportunities, but I am disappointed we have not won the game." "I can't believe I am standing here with only one point instead of three. It sums up how tough it is proving to be for us just at the moment. "There is nothing wrong with our team spirit or camaraderie. The answer, the solution, lies where it always does in these circumstances. "We will study what happened and why, then get out on the training pitch and sort things out. I am not downhearted, I am just disappointed." Match ends, Nottingham Forest 1, Ipswich Town 1. 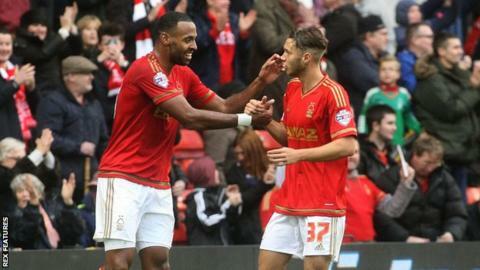 Second Half ends, Nottingham Forest 1, Ipswich Town 1. Goal! Nottingham Forest 1, Ipswich Town 1. Liam Trotter (Nottingham Forest) right footed shot from very close range to the centre of the goal. Attempt blocked. Jorge Grant (Nottingham Forest) right footed shot from the right side of the box is blocked. Offside, Nottingham Forest. Liam Trotter tries a through ball, but Nélson Oliveira is caught offside. Liam Trotter (Nottingham Forest) wins a free kick in the attacking half. Foul by Chris O'Grady (Nottingham Forest). Jorge Grant (Nottingham Forest) wins a free kick in the defensive half. Attempt missed. Nélson Oliveira (Nottingham Forest) right footed shot from outside the box is high and wide to the right. Assisted by Ryan Mendes. Substitution, Ipswich Town. Piotr Malarczyk replaces Freddie Sears. Substitution, Nottingham Forest. Chris O'Grady replaces Jack Hobbs. Attempt missed. Daryl Murphy (Ipswich Town) left footed shot from outside the box is close, but misses to the left. Assisted by Christophe Berra with a headed pass. Attempt missed. David McGoldrick (Ipswich Town) right footed shot from outside the box is too high. Assisted by Freddie Sears. Corner, Ipswich Town. Conceded by Eric Lichaj. Attempt missed. Daniel Pinillos (Nottingham Forest) left footed shot from outside the box misses to the right. Assisted by David Vaughan. Goal! Nottingham Forest 0, Ipswich Town 1. Jonathan Parr (Ipswich Town) right footed shot from the centre of the box to the top right corner. Attempt missed. Ryan Mendes (Nottingham Forest) right footed shot from outside the box is high and wide to the right. Assisted by David Vaughan. Offside, Nottingham Forest. Daniel Pinillos tries a through ball, but Jorge Grant is caught offside. Substitution, Ipswich Town. Jonathan Douglas replaces Cole Skuse because of an injury. Substitution, Nottingham Forest. Jorge Grant replaces Jonathan Williams because of an injury. Offside, Nottingham Forest. Dorus de Vries tries a through ball, but Nélson Oliveira is caught offside. Delay in match Jonathan Williams (Nottingham Forest) because of an injury. Attempt missed. Liam Trotter (Nottingham Forest) left footed shot from the centre of the box misses to the left. Assisted by Daniel Pinillos with a cross. Corner, Nottingham Forest. Conceded by Cole Skuse. Corner, Nottingham Forest. Conceded by Jonathan Parr. Attempt blocked. Nélson Oliveira (Nottingham Forest) right footed shot from outside the box is blocked. Attempt missed. Daryl Murphy (Ipswich Town) left footed shot from the left side of the box is close, but misses to the left.